In celebration of the 4th of July, we always had family cookouts when we were growing up. Along with fireworks my uncle set off in the field beside our house. When fireworks were legal, of course, way back long ago! I can still remember the Roman candles he’d set off, making sure we kids were well out of their range, and carefully aiming them away from anything that could catch on fire. (In case you’re wondering, my mother’s house was just outside the town limits, so we didn’t have to worry about any restrictions.) We also had strings of regular firecrackers, cherry bombs, and colorful sparklers that we loved to swirl and make designs with in the air, long before it became fashionable to use them for weddings! And of course, there were those round snappers we threw on the sidewalk so they’d make a sharp “bang”, leaving a tiny trail of smoke. Oh, the fun we had…..!! And none of us got hurt, thank goodness! Would we do this for our kids now?! Heck, no! But first of all we’d eat our dinner of charcoaled burgers and hot dogs, with my mom and my aunts contributing homemade potato salad, macaroni salad, coleslaw and of course potato chips and baked beans, with an occasional plate of freshly deviled eggs! What a treat it was, especially combined with Mom’s homemade iced tea punch that I’ve forgotten (sadly) how to make. Although I think it included grape juice…maybe I’ll attempt it if none of my fellow Eastern Shore friends have a similar recipe they can share. Anyway, nothing could compare with those burgers cooked on that old charcoal grill. It was a great taste treat, with just the tiniest hint of a bit too much lighter fluid thrown on the charcoal briquettes, which somehow always added to the taste to the meat. Dessert was usually fresh homemade ice cream, the kind you could get a massive brain freeze from if you ate it too quickly. And we usually did! With plenty of strawberries thrown over that pile of frozen vanilla goodness! 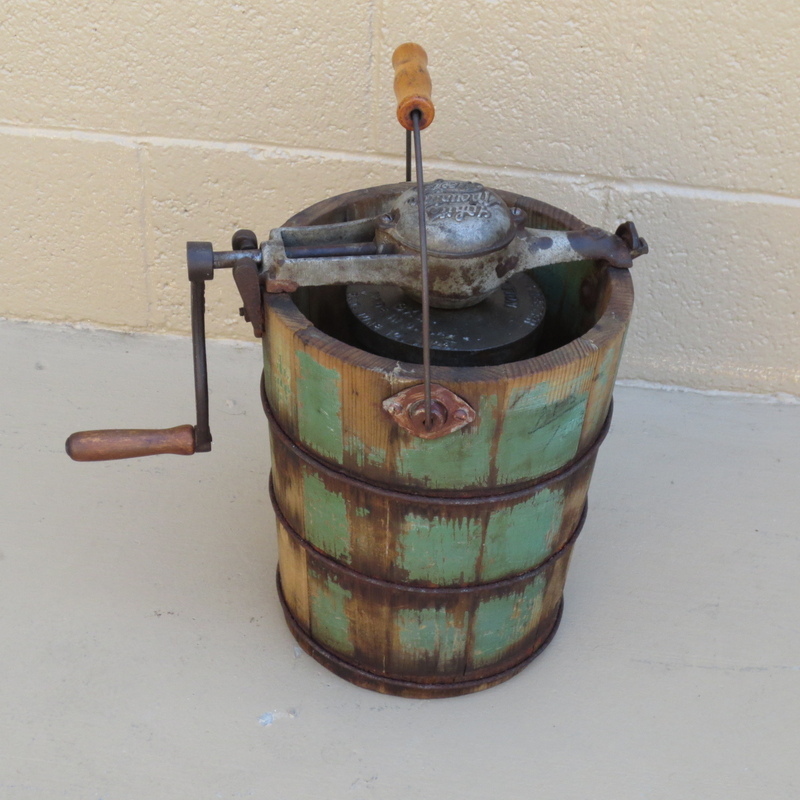 For years my mom used an old wooden ice cream freezer to make her homemade ice cream. I’m not sure, but it must have belonged to her mother at one time, because even back then, its once bright green paint was almost gone. The inside can had a wooden paddle inside, and we used to argue over who would get the chance to lick that paddle once the ice cream was finally frozen! We’d fill the bucket with rock salt and ice, and turn the handle, only stopping when it would barely turn any more, which meant it was finally ready! There have been many times I’ve wished for that old ice cream maker, because even using her recipe, the ice cream just doesn’t taste the same in the newer, modern appliances. There’s just something to be said about some of those old vintage products! Yes, those were the days, as the saying goes! And sometimes I long for those days, to just be able to re-live a few of the good times, to see if they really were as good as we remember them! So in celebration of this year’s 4th of July, I’m sharing our family recipe for homemade ice cream. Just remember, it may not taste the same if it’s not made in that old wooden ice cream maker, but since most of us don’t have one any more, let’s just see if we can bring back a little of the old time memories, and calories, just for old times’ sake! Mix ingredients together. Fill inner metal container about 2/3 full of ice cream mixture and place paddle in the middle; cover tightly so rock salt (ice cream salt) won’t leak inside. When handle will barely turn any more, it’s ready! Remove the handle, carefully remove the cover on the inside can, and place paddle in a bowl to be enjoyed by the kids! Place ice cream in freezer until ready to serve. Note: This makes a wonderful vanilla, however, if you wish, you can add crushed fruit of your choice, but we usually ate it with the fruit generously spooned over it. Next I Changed My Shoes!